Clockwise from left: me (obvi), front embroidery detail, back embroidery detail. Day 267 . Hat 267: Black baseball-style cap with embroidery detail of a white clothespin, the blue capital letters "F" and "L" to the left and right respectively against a circular embroidered background of gray. 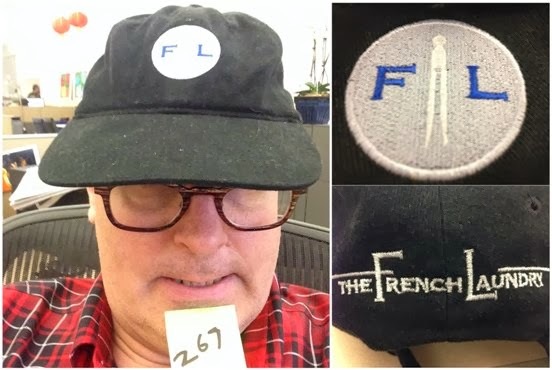 Additional detail includes the words: "The French Laundry" in white embroidery on the back of the hat and an interior tag that reads: "Headmaster, Inc. one size fits all (59 cm), 100% cotton, made in Bangladesh." The French Laundry, as foodies the world over know, is chef Thomas Keller's famed Yountville, Calif., restaurant (so named because it had been, back in the 1920s, a French steam laundry). I had the good fortune to dine there once and have been a fan of Keller's restaurants ever since. The Bride took me to his New York City restaurant Per Se for my 40th birthday and it was such a gastronomic high point for me that ever since I've been slowly trying to eat my way through the remainder of Keller's edible empire. To date I've added Bouchon restaurants and Bouchon Bakery locations in Yountville, Calif., Las Vegas and New York City to my Keller dance card. By my reckoning, that leaves just one restaurant -- ad hoc in Yountville -- to go. And if the restaurant's got hats for sale I can probably kill two squabs with one pizza stone.